PROFIsafe uses the “Master-Slave” mechanism for transmission of safety telegrams. The master, typically called the “F-Host”, cyclically exchanges safety-relevant data with all its configured slaves called “F-Devices”. Each F-Device has an F-Driver organizing the co-ordination of safe messages called “Safety PDUs” (Protocol Data Unit) between the F-Host and F-Slave. CRC calculation of the PDUs depends on the message size to be transferred, the distinction being between “slim PDU” up to 12 bytes and “long PDU” up to 123 bytes. CRC 24 is used for slim PDU calculation, while for long PDUs, CRC 32 is used. As a means for message recipients to determine whether telegrams arrive in the right sequence, PROFIsafe uses consecutive numbers for the safety telegrams. Additionally, monitoring of the tolerance time (F-Watchdog Time) that is reset upon receipt of a telegram ensures that always the currently valid telegrams are read. 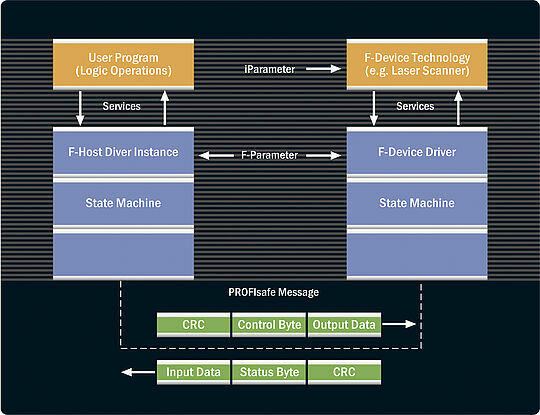 The so-called F-Parameters (PROFIsafe parameters) supply a unique identifier between F-Host and F-Device. Although the addresses (Unique Codename) are automatically passed on to the F-Devices, the target addresses need to be adjusted directly at the device via DIP switches. The F-Devices receive their configuration through transfer of the F-Parameter via “GSD” (General Station Description) and of the I-Parameter (individual F-Device Parameter). These parameters are managed within the iPar server, from where they can be transferred to a PROFIsafe Device using standardized interfaces. Usually, the iPar Server comes integrated in a “CPD-Tool” (collaborative product design) engineering tool. For product designers, this means that for the ability to completely configure an F-Device, a GSD file needs to be created and an interface to the CPD-Tool must be provided for each product.